Strawberry shortcake is one of my all-time favorite desserts! 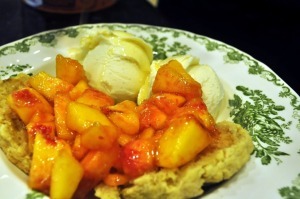 With so many beautiful peaches at the Farmers’ Market right now, I created a shortcake to complement them. 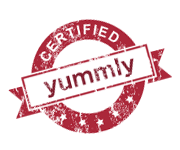 If you really want to amp this dessert up, you can drizzle it with Raspberry Coulis! Dust a sheet of wax paper with flour and pat dough until it’s about 3/4 inch thick. Cut with round biscuit cutter about 3-inches in diameter. Spread out evenly on a baking sheet lined with parchment paper. Bake for 20 minutes until risen and lightly browned. While shortcakes are in the oven, prepare peaches. Slice shortcake in half, place in a soup bowl, and spoon peaches over it. Place 1 – 2 scoops Vanilla Ice Cream next to shortcake and drizzle Amaretto over it. Such a fabulous dessert, I love these flavors! This looks like heaven to me, and with raspberry coulis , double heaven! Every summer I do my best to get my hands on peaches. This is a beautiful way to enjoy them. Thanks for sharing. Thank you for this recipe. 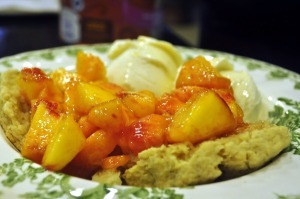 We are about a month away from getting our Palisades’ peaches and I cannot wait. Yes, I agree, a raspberry coulis would be a very, very nice touch.